This component uses the ServiceNow API to retrieve data and load it into a table. This stages the data, so the table is reloaded each time. You may then use transformations to enrich and manage the data in permanent tables. 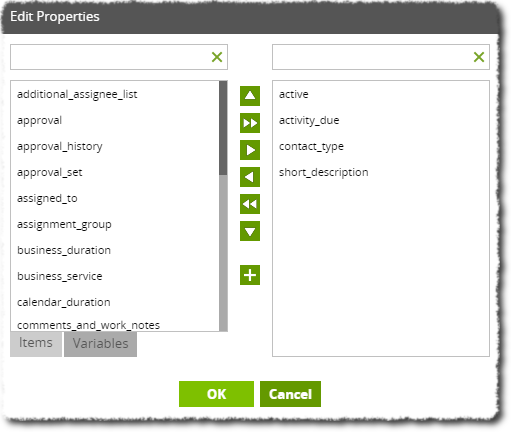 Basic/Advanced Mode Choice Basic - This mode will build a ServiceNow Query for you using settings from Data Source, Data Selection and Data Source Filter parameters. In most cases, this will be sufficient. Advanced - This mode will require you to write an SQL-like query which is translated into one or more ServiceNow API calls. The available fields and their descriptions are documented in the data model. Limit Number Fetching a large number of results from ServiceNow will use multiple API calls. These calls are rate-limited by the provider, so fetching a very large number may result in errors. Data Centre Text Provide an address for the desired ServiceNow server. 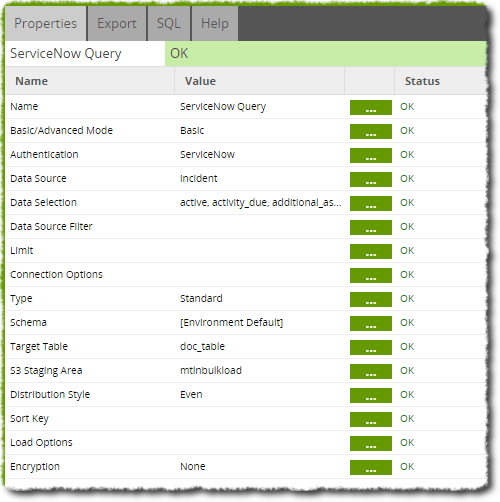 In this example, we will use the ServiceNow Query component to load data into a table. For this to happen, an orchestration job must be made that includes the component and also ensures that a table exists to load data into. The job canvas is shown below. The ServiceNow component is set up to use an OAuth we have previously configured and we choose a data source from the options provided, automatically compiled from the service we have connected to. For data selection we have simply included every column and left other properties blank or as default. The Target Table is named after the table made in the Create/Replace Table component and an S3 staging area is chosen, as is required. If we load this table in using a Transformation job, we can sample the data, as shown below. This works, however might be a little overwhelming. Let's say we really just want to find when activate members are next due activity on their accounts; thankfully we can also use the ServiceNow Query component to filter the data it loads. 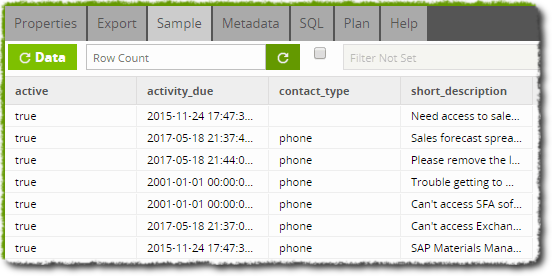 We go to the 'Data Filter' property of the ServiceNow Query component and set it up to include only rows where values in the 'active' column are 'true'. We also take the time to narrow down the number of columns we include. By selecting the 'Data Selection' property, we can include (right-hand column) only the active, activity_due, contact_type and short_description columns; the latter two included to give some flavour to our data. Everything else is excluded (left-hand column). Running this job again and returning to the Transformation job, we can now sample our new data. As can be seen, the data now is much cleaner and appropriate to our interests. Note that the 'Filter' component can also filter data after loading it into a table and is a good way to take one data source and branch it out into differently-filtered workflows.